Script: https://news.google.com/?tab=w…aa=1&hl=en-US&gl=US&ceid=US:en:80". This happens every time I go to Google News. Thanks for any help, Ron. Well, it takes a while but it works. Maybe just a complex news message? Ron, what are the details of the system you are using? Ron, your message ended up in the spam folder. I restored your message. 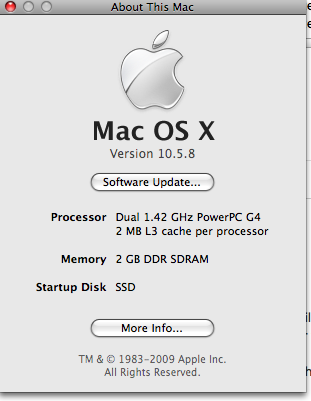 Looking at your system specs I'd say your Mac is sufficiently capable to run Google News. This website will be kind of slow on any older Mac, though. On my PowerBook 1.67 GHz I get a few seconds of the spinning beach ball when loading the site, but it comes up fine eventually. - Type about:config (just like one word, no spaces) in the URL bar. Press Return. - Confirm that you'll be careful. - Scroll down to dom.max_script_run_time (or type it in the filter), double click it and set the value to 0. Thank you. I followed your instructions and so far it works.